Mental health and wellness is a known public health priority. Last year, in response to gaps identified by the public health community, the six National Collaborating Centres for Public Health (NCCs) published a collection of resources on population mental health promotion for children and youth – a major contribution to the current knowledge base. This year, the NCCs built on this work by convening a national gathering to explore public health roles for promoting mental health and wellness. On February 28, 2018, in Gatineau, Québec, the NCCs, in partnership with the Public Health Agency of Canada, the Centre for Addiction and Mental Health, the Canadian Mental Health Association, and the Mental Health Commission of Canada, brought together 70 leaders from public health, mental health and Indigenous health organizations from all provinces and territories. This two-day forum, entitled Population mental health and wellness promotion: Clarifying the roles of public health, was oriented to population health, and underpinned by determinants and enablers of positive mental health and wellness. Positive mental health is a multi-faceted concept, one that is distinct from mental illness and embraces emotional, psychological and social components. Although holistic considerations of health which include positive mental health are recent in Eurocentric worldviews, they have been, and continue to be, central to Indigenous peoples. Thus, the forum intentionally bridged Indigenous and non-Indigenous knowledge. 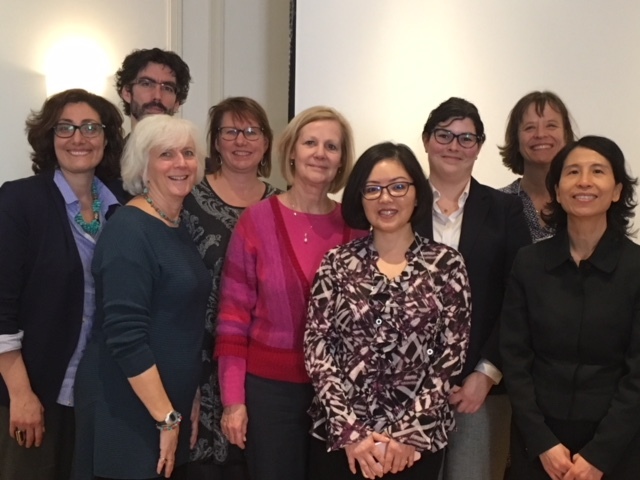 Accordingly, NCCs, partners and representatives from the Thunderbird Partnership Foundation, University of Toronto, Ottawa Public Health, Saskatchewan Health Authority, Institut national de santé publique du Québec, and the BC Ministry of Health contributed to the event’s advisory committee. The NCCs – with the collaboration of the advisory committee – developed a forum charter. This document articulated a shared understanding of the current context for population mental health and wellness in Canada, including the need to focus on clarifying roles for public health. “I’m excited by the partnership evolving with public health, facilitated by the NCCs. A public health approach will support promotion of mental wellness throughout all stages of a person’s life and a family’s development. It will help balance the clinical focus on mental illness only after it’s become acute. The forum opened with presentations from key speakers: Margaret Barry from the National University of Ireland Galway and Carol Hopkins of the Thunderbird Partnership Foundation. Their presentations were synergistic: Margaret introduced concepts, policy and implementation approaches for population mental health promotion, and Carol presented a First Nations mental wellness framework. Day two combined panel presentations and small group working sessions. Presenters drew from expertise and experience from multiple sectors, including Indigenous, charitable and government. This laid the groundwork for participants to delve deeper in small groups. Lead and champion the paradigm shift away from mental illness and toward societal, community and family wellbeing. Embed and integrate Indigenous knowledge, frameworks, ways of knowing, types of evidence and processes. Recognize and integrate a wider workforce, including Indigenous Elders. Mobilize and share knowledge across sectors, engaging, convening and working in partnership with different stakeholders. Communicate and advocate for resources to address inequities and engage in mental health promotion. Measure impact and outcomes through indicators and evaluation processes that are strength-based, culturally relevant and participatory. a business case to invest in mental health and wellness promotion upstream. “The public health workforce is well positioned to collaborate; build partnerships with other key actors; assess community needs; and support, advocate for, implement and evaluate policies, programs and initiatives that address the social determinants of mental health at many levels throughout the life course. This event helps us clarify roles, build networks, and collaboratively develop the specialized workforce we need to advance positive mental health." And take note! The call for abstracts is now open for the Canadian Mental Health Association’s third annual Mental Health for All Conference, October 22-24, 2018 in Montreal. The conference organizers plan to have a specific stream on the role of public health in population mental health. Visit our project page on population mental health promotion to download the event charter, presentations from the event and a reading list shared by event partners. This recent full-day workshop at The Ontario Public Health Convention (TOPHC) featured related NCC work. This NCC collection for public health in Canada was produced in 2017, and includes contributions from each NCC, as well as a national resource scan (available for download in excel format). An NCC presentation was featured in this panel at the Atlantic Summer Institute on promoting child and youth mental health in August 2017. This document, a translation from an original published article, builds on previous work by the NCCHPP and illustrates how the population mental health framework for public health could be implemented in the Québec context. This NCCHPP briefing note proposes a portrait of the context, stakeholders and initiatives that support public health action in population mental health in Canada. This NCCHPP briefing note summarizes emerging needs with regards to population mental health in Canada and identifies orientations to support the Canadian public health workforce in this field.